A game’s controls being deliberately obtuse or unintuitive used to be a sign of a poorly designed game. Indeed the whole reason I avoid certain genres, survival horror being one of them, is that their controls are usually designed in a way that breaks your natural motions in order to induce extra challenge or panic. However most recently a new genre of games has popped up that thrives on this very idea, making games that use weird control schemes that are highly unintuitive and very specific to that game. These are often coupled with all sorts of weird and wonderful game play ideas, ones that really don’t fit the mould of any one genre. 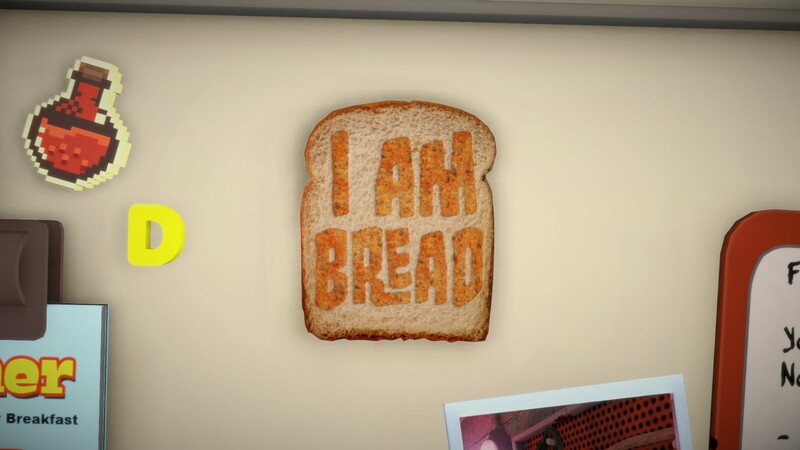 The latest title to fall under this banner (which I’ve tentatively termed Frustration Simulators) is I am Bread which should basically tell you everything you need to know about this weird indie experiment. You are bread. You do not know how it came to be that you are bread but you do know your ultimate purpose: you become toast. For some reason though the person that brought you here doesn’t seem interested in supporting your goals so you must take it upon yourself to make yourself the goldeny treat you so desire to be. Indeed your quest seems to irritate your captor to no end with him putting you in all sorts of places where becoming toast is more easier said than done. But no matter, there are many ways to become toast and you shall do so until the final slice. I am Bread feels a lot like the other simulator-esque games that have come before it like Surgeon Simulator and Goat Simulator. This is almost wholly due to its Unity and, from what I guess, are stock 3D models that they’ve used to create the worlds you’ll flopping yourself through. It’s not a bad aesthetic at all just one that’s become the default for titles like this much like all Flash games of years past shared a very similar look due to the limitations of the platform they were built on. The flip side of this is that I am Bread will likely run at anything you throw at it. This will likely be its boon when it comes to phones and tablets later this year. The goal of I am Bread is simple: you’re bread and you want to become toast. Initially this goal is an easy one to understand, you’re on one side of a kitchen and there’s a toaster thats on the other side which you have to get to. You do this by flopping yourself around which you can do by sticking one of your four corners to a surface and swinging around on that point. Whilst that might sound relatively easy there’s an awful lot of obstacles that stand in your way and should you hit them your edibility rating will start to plummet. You also have a limited amount of grip so you can’t simply throw yourself up on the room and tarzan your way across the room and hope for the best. After the first level though making yourself toast isn’t as straightforward of a challenge as it first was and this is where you have to get creative. I am Bread tells you upfront that it’s better played with a controller and, after struggling to play the first section with a mouse and keyboard, I couldn’t agree with them more. However that’s not going to make the game easy, far from it, more it’s just slightly more intuitive when you’re using the shoulder buttons of a controller to control each of the four corners rather than the awkward keys they selected. You’ll still have to endure the steep learning curve for controlling your unwieldy piece of bread but after a while you’ll develop strategies to help you traverse sections faster and to avoid flopping around helplessly on the ground. It seems the game’s time in Early Access was well spent as there’s mechanics to make the game more palatable if you’re struggling to make it past a particular section. Should you become inedible twice a power up will appear next to the starting point that gives you unlimited grip and edibility. You can choose not to take this however if you just want to explore or have fun triggering all the set pieces in the environment it means you don’t have to endure the tedium that these games are renown for. Suffice to say I only ever managed to complete a level once without having to resort to that buff but, honestly, had that buff not been there I would’ve put the game down after 10 minutes. For me though games like I am Bread have somewhat limited appeal as whilst it’s fun to play around with experimental mechanics like this, coupled with the hilarious results of a semi-working physics engine, the sheen starts to wear thin rather quickly. I’m sure many will find a lot to love in getting high scores or finding new and inventive ways to cook themselves but I simply can’t find the appeal. This is not to say I am Bread is a bad game, far from it, more that if you’re not the kind of person that likes making their own challenge within a game then you’ll likely get bored with I am Bread after the first level. I am Bread is a truly unique game that’s hard to find comparisons for as it really is unlike anything else that’s come before it. 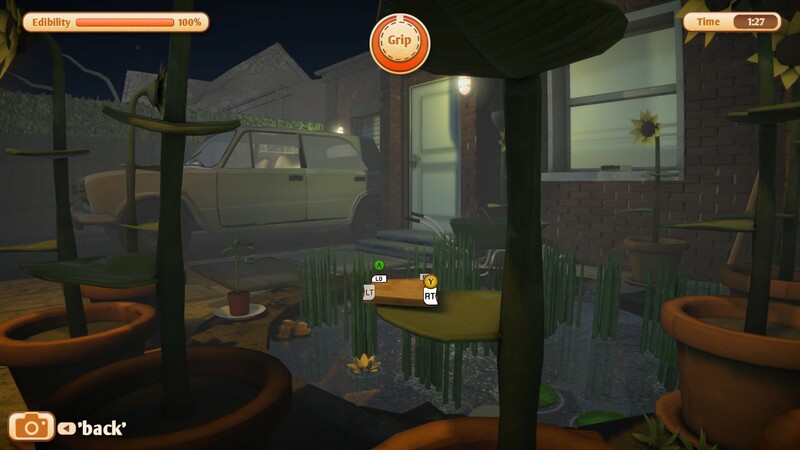 The control scheme, whilst being frustrating at the best of times, is what distinguishes I am Bread from your garden variety 3D platformer. The main game mechanic and the way it plays is charming, hilarious and satisfying when you finally achieve your ultimate goal. However since the core game doesn’t change much the replayability is incredibly low, meaning that for people like me the game starts to lose its appeal very quickly. Still if you were a fan of other frustration titles like this then you wouldn’t go astray with I am Bread and I’m sure you’d find much more to enjoy in it than I did. I am Bread is available on PC right now for $12.99. Total play time was approximately 2 hours. 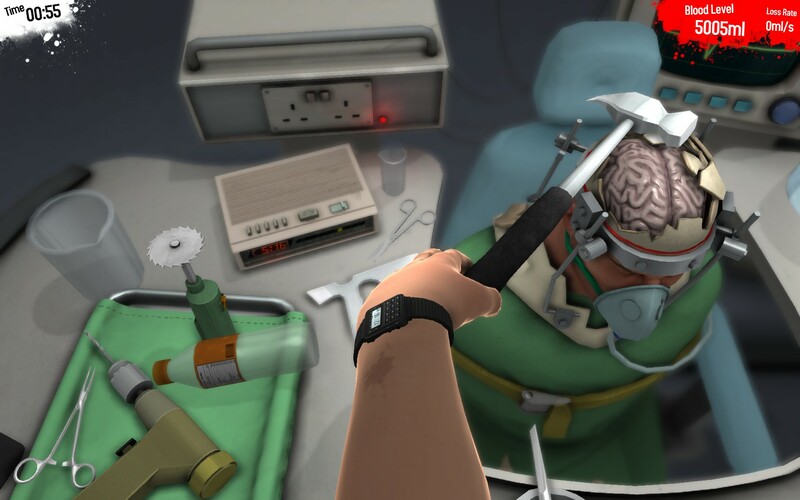 Surgeon Simulator 2013: BOB I GOT THIS. If you’ve ever played QWOP you can understand the appeal of games that are intrinsically badly designed, usually to provide challenge in an otherwise ru rudimentary game. I’m not sure what it is but they seem to trigger the competitive OCD part of my brain, pushing me to master them even though there’s little to be gained since none of the skills gained in these games translate to other titles. They do provide a rather weird sense of enjoyment though, usually when I find a way to beat the system through an emergent property of the game that is, again, due the deliberately bad programming/controls/physics. 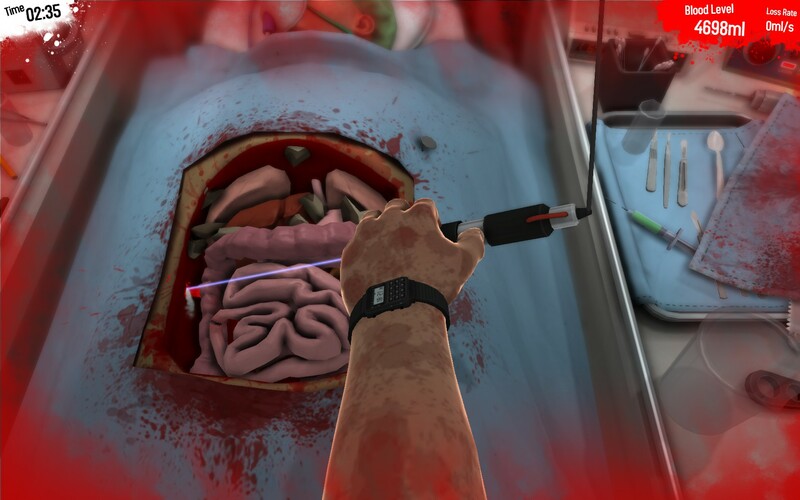 Surgery Simulator 2013 is yet another title that fits in the “deliberately bad but devilishly fun” genre and I spent some time with it over the past week. Born out of this year’s Global Game Jam Surgery Simulator 2013 started off as a comical heart transplant simulator where you, an unnamed doctor (or are you? It’s never really made clear), must get a new heart in your patient before they run out of blood. Unlike games like Trauma Centre which attempt to recreate the tension of performing medical procedures like this Surgery Simulator instead puts you incontrol of a single hand that you must use to perform all tasks, one that’s incredibly awkward to control. Still you persevere, performing heart transplants, double kidney replacements and even a brain transplant. For a game that was originally created in 48 hours I have to say I was very impressed with the graphics in Surgery Simulator 2013. Granted they’re nothing spectacular but the stylization, almost TF2 like in nature, adds to the overall comedic tone. The level of detail in the environments are also quite astounding with all sorts of stuff you’d expect to see in a reception/surgery and, quite surprisingly, most of them functioning in some way. I have to say I didn’t expect any of the floppy disks to work when I put them in the drive, nor the pen to draw on the paper when I first started mucking around. 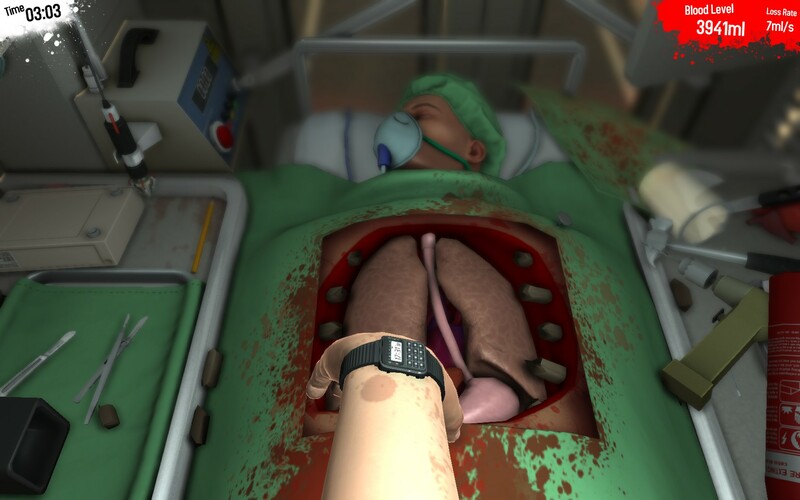 The premise of Surgery Simulator 2013 is simple: you need to get the new organs in the patient before they run out of blood. This sounds a lot easier than it is as the patient loses blood every time you hack into them and should you be… less careful with where you bash/slash/cut they’ll start to continually lose blood, putting a firm timer on how long you have to complete it. This is made all the more difficult by the controls which aren’t exactly intuitive, especially with the way they interact with the various tools and organs you’ll be working with. Your hand is controlled by a combination of your keyboard and mouse. The A, W, E, R and Space bar keys represent your fingers which works fairly well although I often found my hand getting out of place after a little while. Your hand’s position and rotation are controlled by the mouse with regular mouse movement changing the overall position, depressing the left mouse button dropping your hand down and the right mouse allowing you to rotate your arm and move your wrist. If this sounds confusing it most certainly is and this is where the challenge comes in, mastering these whacky controls in order to perform the correct actions. I thought that since I’d played a little bit of the original game I’d be more than capable of doing the same actions in the full version of Surgery Simulator 2013 but I couldn’t have been more wrong. The original was a little more liberal in what you could accomplish without severely injuring your patient like being able to bust open the entire rib cage with a single, well placed hammer strike. Attempting the same thing in this version seemed to do a lot more harm than good, often resulting in ~10% of their blood disappearing and leaving them bleeding rather quickly. It seems that the best way to complete most surgeries was with a light, precise touch, something I didn’t think was actually possible. 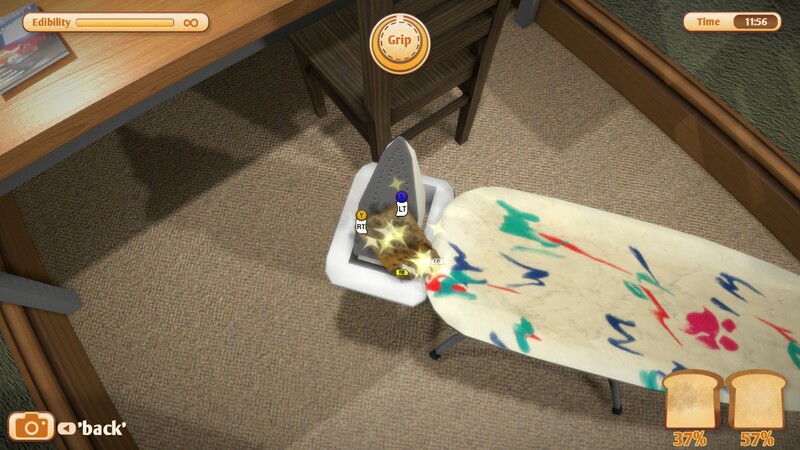 So whilst you might be able to accomplish everything by using the power tools to slice and dice your way through and knock organs flying with the hammer should you want to go after any of the numerous achievements you’d be advised to try the light touch and use the scalpel/surgery laser more often. Indeed whilst I might not be at A++ level on any of the surgeries yet I definitely found it a lot easier once I started playing it a little more carefully. There’s also the green syringe on the side which when used on the patient stops any bleeding completely which is a godsend when you’re trying to find out where to cut and failing miserably. If you’re not finding the regular surgeries much of a challenge then there’s the Ambulance Mode which ratches up the difficult level significantly. You’ll get all the same tools however you’ll be constantly bounced around, moving all your tools around and often throwing something onto/into your patient. You can also lose things out the back of the ambulance, including the organ you’re trying to replace. Whilst it’s not impossible it sure is a damn sight harder, especially when the fire extinguisher keeps landing on your patient’s head. For a game that was built in 48 hours then polished over the next few months Surgery Simulator is a surprisingly well done game, expertly capturing the “so bad it’s good” idea with it’s awkward control scheme and rediculous game premise. If you’re someone who likes to master the nigh on impossible then there’s a lot to love in Surgery Simulator 2013 and the myraid of achievements is sure to keep you coming back in the hopes of performing the perfect surgery. It’s certainly not a game for everyone, especially if you can’t stand being frustrated by bad controls, but the hilarity that ensues is most definitely worth the price of admission. 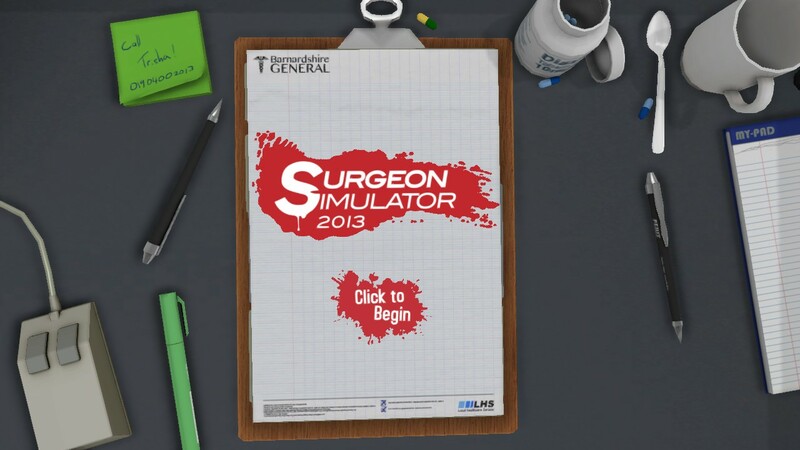 Surgery Simulator 2013 is available on PC right now for $9.99. Total game time was approximately 2 hours with 29% of the achievements unlocked.